Oops! Got a little distracted and behind the last couple of weeks. We actually just finished school for Faith & I (Ben has a couple of more weeks at his preschool), so between life & final grading, etc, it got a little busy. This past week, Faith had hot lunches and Ben had a swine-flu-break at school (which was bad for me as I had to figure out childcare options, so not fun). These lunches are from two weeks ago. We had a round of matching Monday, of course! 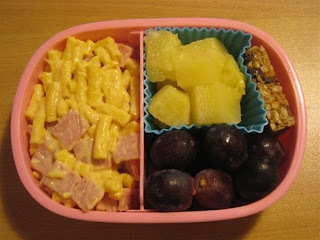 We had leftover macaroni & cheese, so I turned that into a pasta salad with lots of ham (yum!). They also had pineapples, big purple grapes, some granola bar, and a side container of vanilla yogurt (not pictured). 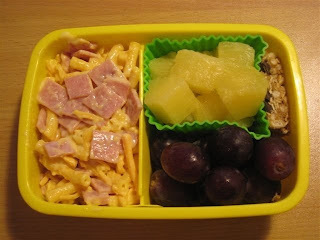 Faith "loves" pasta salad and Ben likes macaroni in his lunch, yay!